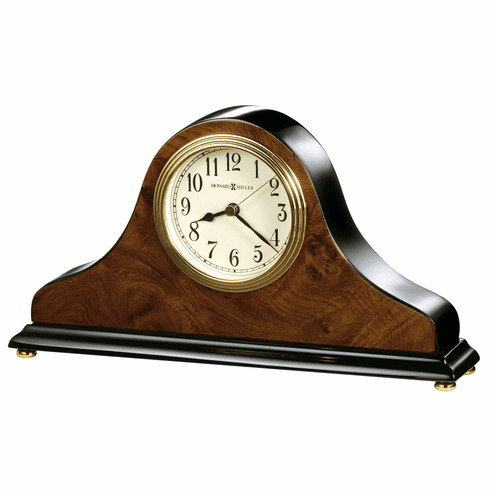 An attractive high-gloss walnut piano finish on a hardwood tambour style table clock featuring a wood burl pattern on the front and back, with black sides and base. Polished brass button feet. Polished brass tone waterfall bezel and glass crystal. The off-white dial offers black Arabic numerals, black hour and minute hands, with a brass second hand. Quartz movement includes the battery. Hand assembled. Includes 1-year manufacturer warranty. Requires battery. Dimensions: H: 6", W: 10-1/2", D: 2"